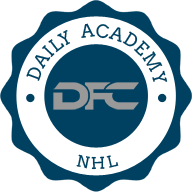 'Line Stacking,' is a very popular, and effective strategy in NHL DFS, especially in GPP formats. The strategy is similarly used in other DFS games, football included. The same correlation we find in stacking a quarterback with a receiver in football, can be found by stacking skaters that play on the same line even strength or on the power play. The thinking is simple, if you pick a player who scores a goal, it's very likely that one, or both of his line mates will pick up an assist on the goal. Also, looking to play defenseman on the same teams as your forwards is a very strong strategy. If you can stack forwards that play of the powerplay with your defenseman, that is ideal. Stacking two lines of three skaters together is a favorite strategy of mine, and many others in GPP's. This helps you create lineups with huge upside, but that are very volatile as well. For cash games, I like to limit stacking to 2 forwards from a line, and one defenseman. It's a boom or bust strategy that's just too volatile for cash games, but is perfect to take down a big tournament. 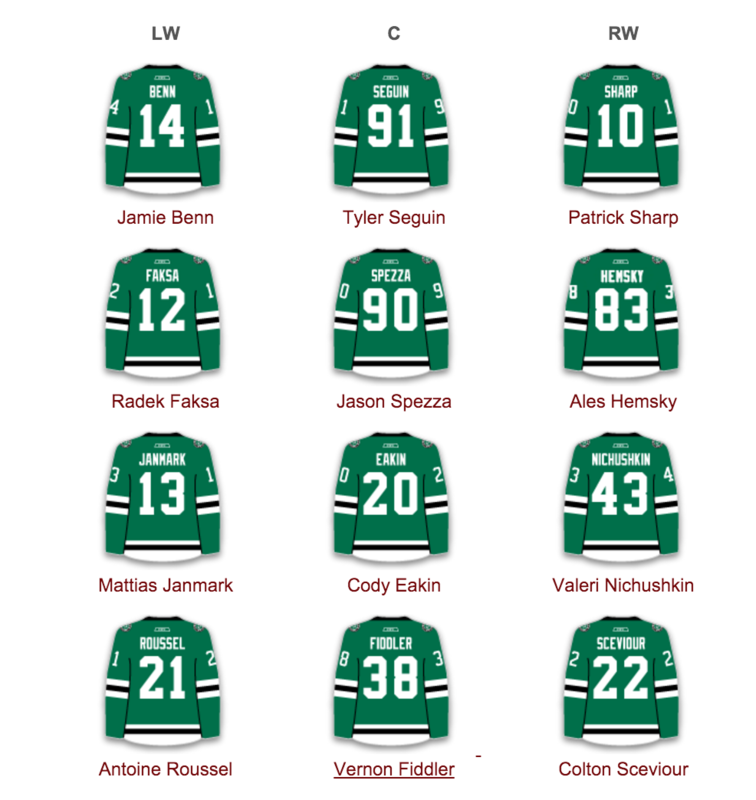 Here I am using just a simple stack, where I am pairing the top line players, which is Tyler Seguin, Jamie Benn, and Patrick Sharp. I could of also dropped Sharp for a defenseman, which is a viable strategy as well. Now I am really trying to take down a big GPP, by trying to hit on two of my favorite stacks. I am putting my chips into the Oilers and Sharks top lines here. I am still taking the first lines, and with these stacks there is a value play on each top line, making it easier to afford better defenseman, and a goalie. 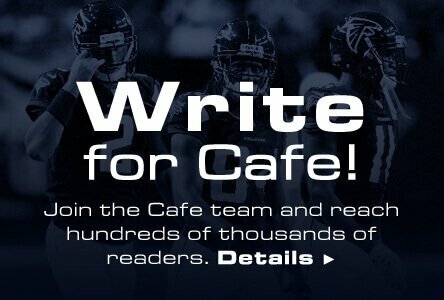 There are many great resources for finding information on which players are player with who, and if you don't have a twitter account, you are missing out on important information every day that your competitors are getting before you. 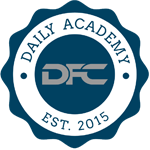 Daily Faceoff and Left Wing Lock are two exceptional resources that I use on a daily basis. 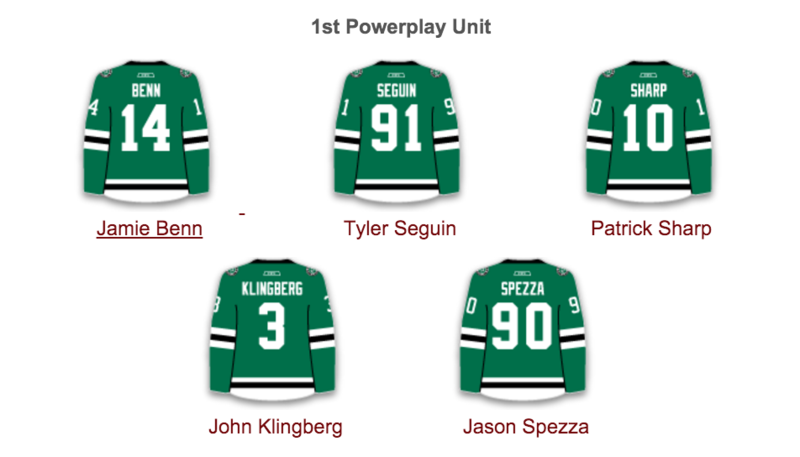 There you will find the most recent line combinations for even strength and power play. Twitter is useful for acquiring late breaking info that won't be updated on sites like the ones just mentioned. Sometimes lines will be juggled during the morning skate or in warm ups, and it's usually a team beat reporter who tweets out the information first. Use the top two lines for stacking, and make sure those players are on the power play units as well. This adds upside to your players, and using strategy one above, you can see the Stars top line follows these rules. Finally, taking a deeper dive into the statistical side of hockey gives you a huge advantage over your playing competitors. A stat I like to use, and one that's proven to be very predictive to success, is using points per 60 minutes played. This basically means, how many points does a player average every 60 minutes he is on the ice. Another great, and free (you can donate to them), tool is found here at Puckalytics. Their 'super wowy' generator lets you track how productive players are when they play together.